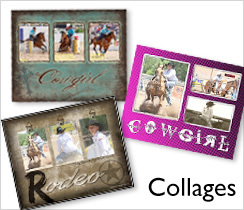 We are so excited to offer the collage prints online! We have been working on these for quite awhile and we think we’ve come up with some really cool designs! There are several templates to choose from and you can add multiple images to one print! Printed on Professional Kodak paper with a Glossy Finish. Create your own custom master piece! You can zoom images, make them B&W, or Sepia. Add custom text in different fonts and colors or do no text at all. Collage prints have always been our number one seller, no you can create your own right here online! To create your custom collage simply add your images to your Favorites (requires an account) and drag and drop them on to your design. One photo with multiple images. Zoom images, B&W and Sepia options too. Add text to certain designs, you pick color and font. 12 different 8x10 designs to choose from currently. 11x14 through 30x40 sizes coming soon!